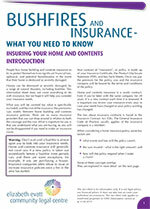 Please click to download the below brochures and flyers. 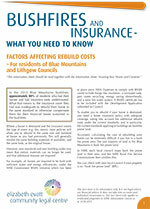 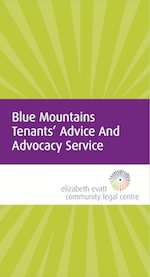 Bushfires and Insurance: In 2016 EECLC ran a series of Bushfires and insurance information sessions for members of the Blue Mountains community, as part of a project funded under the Blue Mountains Flexible Community Grant Program. 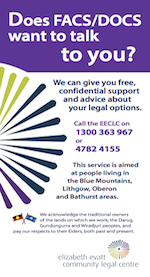 Sessions were presented in Katoomba, Lithgow, Springwood and Blackheath by EECLC staff and our partners Legal Aid NSW, Financial Rights Legal Centre, and the Rural Fire Service. 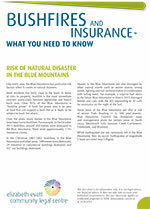 The information sessions focused on providing information about key terms in insurance contracts for building and contents insurance that can affect coverage in natural disasters such as bushfire, combined with information about Bushfire Attack Level (BAL) ratings which can affect the rebuild costs of property. 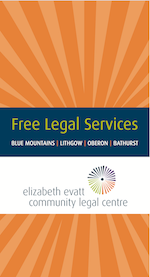 Attached below are the resources produced by EECLC for these sessions.